It's a dangerous trait in a city that has banned all forms of magic and drowns witches in public Cleansings. But it's a useful trait for a thief and a spy. And Julia has learned--crime pays. Her latest job is paying very well indeed. Julia is posing as a housemaid in the grand house of Mrs. Och, where an odd assortment of characters live and work: A disgraced professor who sends her to fetch parcels containing bullets, spiders, and poison. An aristocratic houseguest who is locked in the basement each night. And a mysterious young woman who is clearly in hiding--though from what or whom? Worse, Julia suspects that there's a connection between these people and the killer leaving a trail of bodies across the frozen city. The more she learns, the more she wants to be done with this unnatural job. To go back to the safety of her friends and fellow thieves. But Julia is entangled in a struggle between forces more powerful than she'd ever imagined. Escape will come at a terrible price. I am not sure how to begin with my sentences for this book review. I'm lost for words, not because I don't like the book, I honestly love it. It's just that this type of book is what I'm looking for these past months because I had my reading slump and this book made me want to finish the other books on my pile. 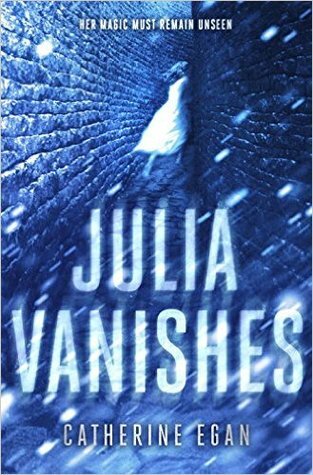 Julia Vanishes is a young adult, fiction type which involves magic and witches, a good to read book and something enjoyable since it involves adventures. Some people might fight it dull on the first parts of the story but the middle until the end is the one that really catches my attention. Every character has it's own secrets that you will just discover on the middle part of the story and that I could say is really interesting and of course that's for you readers to find out *wink*. Julia, herself is powerful and she might not know what she is yet, but I couldn't wait for the next book to reveal her real identity. On this book she showed other ability aside from her ability to get invisible, and what makes this book more interesting is that, I feel like I'm reading a Percy Jackson type of book. Finishing this is really satisfying at the same, time I can't wait to read the next one to come out. The book could stay as what it was now but there are more things to happen, --- SPOILER --- they wasn't able to defeat the enemy but they were able to escape so the next book? It is worth the wait. Julia's ability isn't the usual one from time of Mrs. Och and maybe it is a new one, I wasn't sure too so I can't wait to find out. Hopefully!!! Book two soon?